We call them 'the undocumented' because, in Ireland, we're too polite to call them what they really are: illegal. But that's how Donald Trump's administration sees the 50,000 Irish people that have entered his country without a visa or overstayed their welcome. Plain and simple, in the eyes of the law they have no rights to be in the US and yet year after year the Taoiseach of the day travels to the White House to plead their case. And rightly so. Whether it's at EU or UN level, we're great at arguing Ireland is a 'special case' - but when it comes to America, the claim does actually hold some water. Enda Kenny's main mission this week is to try to convince Mr Trump to make amendments to a 1960s act that discriminates against Irish immigrants. He said he wanted "to renew the strong case on behalf of the hard-working, tax-paying Irish people in the US who for too long now have been living in the shadows, and want nothing more than to continue making their contribution to this great country". The decision to use his trip to announce a referendum on giving the diaspora voting rights in presidential elections is a strategic move. Such a move has been long talked about and comes with high risks for parties like Fine Gael and Fianna Fáil who don't have the same international network as Sinn Féin. However, the Taoiseach is trying to ramp up the value of the Irish living in America ahead of his meeting with President Trump. In theory, Mr Kenny is fighting a lost cause because Mr Trump built his election campaign around anti-immigrant rhetoric, making arguments like: "Anyone who tells you the core issue is the needs of those living here illegally has simply spent too much time in Washington." Clinton, Bush and Obama always gave a sympathetic ear to taoisigh on St Patrick's Day but none introduced any fundamental change for the 'undocumented'. But Mr Kenny has an opportunity to play Mr Trump at his own game with a combination of rhetoric and bullish politics. It's true that the 50,000 Irish who are illegally living, working and paying tax in America have no right to be there, but our relationship with the US is different. For generations the land of the free offered sanctuary to our ancestors who, it is said, built modern America through sweat and determination. The most recent census figures show that 39.6 million Americans claim Irish heritage. If the proposed referendum on extending the franchise in presidential elections to Irish citizens living abroad is passed, then there may actually come a point where people in America ultimately decide who should be in Áras an Uachtaráin. In Boston, where the Taoiseach will meet the Irish-American mayor Marty Walsh today, one in four people say they have Irish blood. Mr Kenny can expect to get some backing for his cause from Mr Walsh and other high-level politicians this week but it will all come down to his meeting with Mr Trump. Yesterday, the Taoiseach told the 'Friendly Sons of St Patrick' society in Philadelphia that everybody knows "immigration reform is a politically sensitive issue". "However, I truly believe that a US immigration system that addresses the needs of the undocumented Irish, and provides for future legal flows, will be of huge benefit to America," he said. 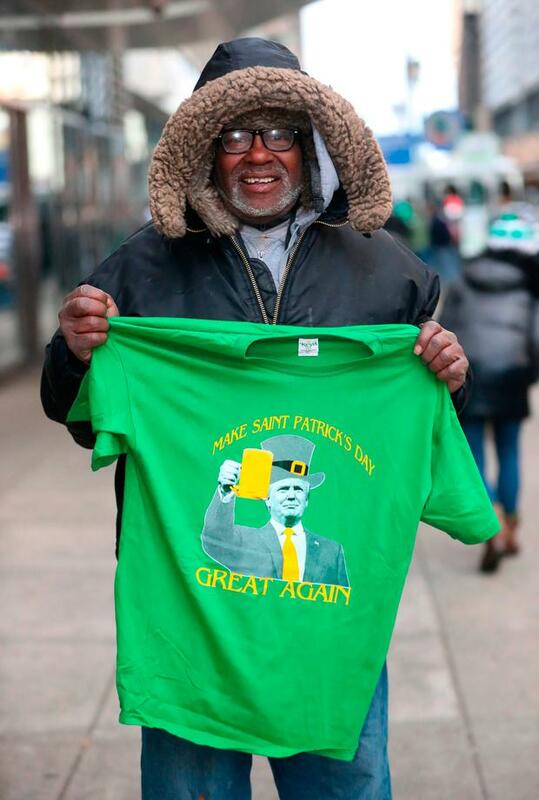 It appears Mr Kenny's message is that the Irish can help make America great again. The Taoiseach is on his swansong with nothing to lose. He must drive home the message that Mr Trump's attitude to immigrants is not in line with that of Ireland, while also realising that we are asking the president to recognise one group of people as illegal and another as undocumented. There is some reason to be hopeful of movement by Mr Trump. For one, he is so unpredictable and volatile that if he is impressed by Mr Kenny's argument he might actually initiate change on whim. But more significant is a line from a keynote election speech on immigration that Mr Trump made last September: "It's our right as a sovereign nation to choose immigrants that we think are the likeliest to thrive and flourish and love us." Surely Mr Kenny can convince the White House the Irish fit that criteria.